“God is good, isn’t He? First thing I would say about this movie is…’it’s not for everyone’! This is not because of the story, it is mainly because of the visual effects, some harsh and violent scenes, which are not meant for the faint-hearted! The story starts like so many others before and after…many years after the war, which turned earth into nothing…a lifeless space where only the worst has survived. 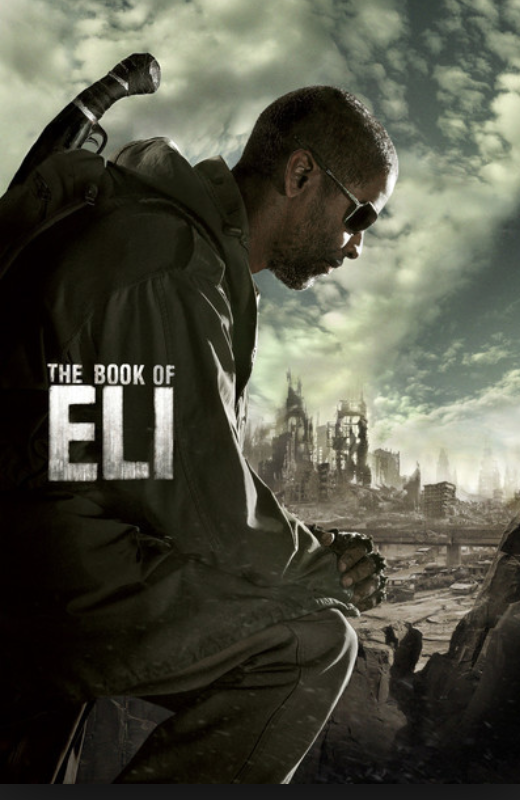 ‘The book of Eli’ is about sacrifice, enduring the pain for believing in something bigger than yourself, following a higher purpose and protecting the futures of many. Most of the reviews I’ve read, call this movie, a post-apocalyptic tale – in some ways it is a tale…I would also say that it is a story about hope and the commitment to save the human soul from becoming ephemeral. As we all know, evil cannot exist without pure good, but virtue is sometimes hard to find and extremely difficult to keep alive. Eli is a lone warrior who takes upon himself to protect and save a sacred book that holds the secret of humanity’s existence and preservation. His nemesis who knows the book’s power wants to take it for himself. The story line brings out the two characters in a constant battle for the most sacred object that can change the humankind’s future. As life proves us each day that we were not created to live and fight on our own…Eli has a companion along his journey…Solara, who does not know the true power of Eli’s cargo but against all odds decides to risk her life to protect it and at the same time save her own. As I’ve watched this movie, I’ve thought that everything is very predictable but I was so wrong…Eli’s secret will be kept until the end of the movie…and believe me, you will want to discover it! If you want your heart to race a bit…if you want to see a different side of Faith…if you think you’ve seen it all…think again:), open your mind and let the adventure join you! Very excellent movie, and review. Thank you so much…I loved this movie, watched it so many times:) I saw I AM LEGEND as well…really strong stories!